I love Folklife. It's such a colorful and culturally diverse event. I managed to pick the weekend's rainiest day, Sunday, to get there. 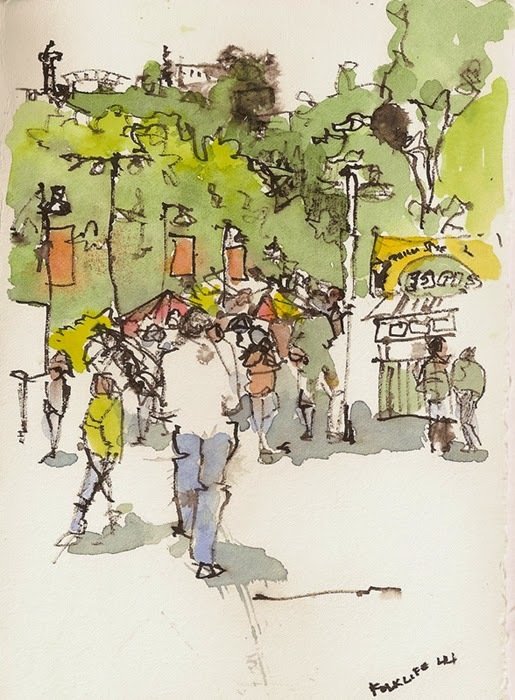 As I sat for my first sketch I figured out I needed to find a covered space and surprisingly there are plenty of them in Seattle Center --trees, outcropping roofs, covered walkways. Had I not forgotten my extra layer I would have stuck around and watched my hometown heros - Samba Olywa. I've been wanting to try twig-sketching for a while and finally got my materials gathered, a good sized twig (or in my case a bamboo shaft), Chinese ink and some decently absorbant paper. It's not an easy tool; the pen dries quickly. I persisted and will keep experimenting. I like the rough quality and variable line quality. Love your loose style, Jane. Thank you for sharing. I'm just getting started sketching again. After a long hiatus I've lost all my chops and your sketches help me study and get back into it. I just love how differently we all sketch. It's fascinating. Always love your sketches, Jane! SO fresh and spontaneous. Looks like you did both Columbia City AND Folklife in the same day!! You were "ON!!"